Fishing must be your favorite hobby; otherwise, you wouldn’t end up clicking this article. With more and more fishing enthusiasts coming into the business, more innovative gears are coming up, too. However, the costs are rising, and it’s quite becoming impossible to cope up your favorite hobby within a limited budget. Well, if you are looking forward to saving cost, a nice, comfortable fishing float tube could be the solution to your problem. You might be thinking that fishing float tubes are not worth it. But don’t underestimate the power of a fishing float tube. They are so much more than just a tube. Fishing float tubes are just as good as kayaks. In fact, they are more than kayaks. Many fishermen still prefer using boats and kayaks, but we tell you, your fishing float tube will take you places. While we have an array of fishing float tubes that we’ve listed today, in the end, you will also read about the factors that you need to consider when buying a fishing float tube and some tips that will make you a pro! Read ahead to know about some of the high-end fishing float tubes that we have listed. These tubes will guarantee you a superb fishing experience. 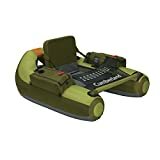 To kickstart our list of the best fishing float tube, we have the Classic Accessories Cumberland Inflatable Fishing Float Tube. This model is an all-time customer favorite for two reasons: its backpack ability and easy-entry front design. Simply put, the Cumberland is a tank for water. The extra high seat makes it extremely convenient for fishers to look around. Plus, the seat is thickly padded with a high adjustable backrest that provides maximum comfort and support for long hours of fishing. Surprisingly, the Cumberland also comes with an ample of storage space. With two cargo pockets that it has, the float tube comes with two drink holders, mesh stuff pocket, two-rod holders, mesh storage platform and some more of your stuff to keep on hand. For clarity, let us explain that the rod holders are the Velcro straps alongside the storage pouches, on the side that’s closest to you. Moreover, the entire tube is made out of Abrasion-resistant PVC bottom and a hydrodynamic hull shape that gives you utmost fishing experience. Fishers are mainly a fan of the unique sculpted design. The U-shaped configuration performs amazingly on the water with improved steering and tracking. It also comes with shoulder straps, making it easier for you to pick it up the trail while hiking. The Cumberland is able to hold up to 350 pounds of load, which is quite a lot for a fishing float tube. With that being said, the fishing float tube keeps you dry and comfortable from all aspects while you enjoy your drink, floating on the lake. Fishing is not easy and needs a lot of patience and courage. You will absolutely love the way the Cumberland takes you around. Highly recommended! It’s no surprise as to why we shouldn’t label it as one of the best fishing float tubes. More importantly, we don’t see any reason for it not to be the best. It’s spacious, stylish, comfortable and everything you need in a tube for a full pack fishing adventure. 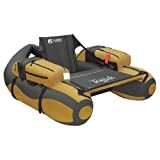 Ladies and gentlemen, the Togiak Inflatable Fishing Float Tube is a classic! The nylon cover is tough enough to pull you through rivers, lakes and any type of water conditions. And on top of that, the hydrodynamic hull shape provides excellent stability, tracking ability and buoyancy. This tube is made in such a way that you can withstand any rough situation. There’s no complaint about the seating arrangement. It’s very roomy. It’s perhaps the most comfortable among the many that we have inspected. The adjustable backrest provides extra support and best perch for fishing. Similar to the Cumberland, the Togiak Float Tube also has roomy armrests that help you store your accessories. It has separate compartments with mesh pockets and flat zipper pockets that let you choose what you want to store in each of them. However, there are no rod holders in this tube. The Togiak Float Tube includes a mesh stripping apron that adds as an advantage to the pontoon boat. You can now assess how good your fishing game is going. As a matter of fact, the mesh apron comes in very handy. It has the D-ring for attaching shoulder straps and other gears. This float tube is way more lightweight for backpacking. So, even if you are a lady of 5’4” and quite lean, don’t worry, this one’s for you. The tube can take up to 300 pounds of load effortlessly. Make your purchase now and take the Togiak to the lake in style. It provides perfect stability on grand fishing expeditions. The Teton Inflatable Fishing Float Tube is your dream come true. If you take a look at its image, you can already sense what of a comfortable and convenient tube it is. 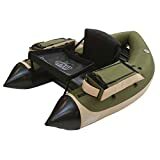 With the price tag that it comes with, it’s hard to find something similar to the Teton Inflatable Fishing Float Tube. The uniquely sculpted design makes it very much convenient for what it’s made: fishing. It comes with a total of three storage areas; two of them are at the armrests and one big pocket in the back seat. There are multiple compartments in the armrests to store your fishing gears as per your convenience. But the back seat doesn’t have pockets. The Teton is 4 and a half feet long with being 4 feet wide. It weighs no more than 16 pounds but can easily carry a load of 250 pounds. Just like the others, the Teton also comes with backpack straps for easy transportation throughout your hiking. The Teton is no exception. It also has the hull shape hydrodynamic design that makes it easier to steer and maneuver the tube. The tube has an unquestionable track straight. Now speaking of the seating arrangement, it’s not as padded as the other brands. But the backrest is surprisingly comfortable. It’s also a bit lower than the other models. The Teton submerges in water from the waist down. But note that heavier people will sink more than lightweight people. The model also has the stripping apron that’s included with fish rulers, which is easier to remove via the Velcro patches. The fish ruler is there to help you measure if your catch is a keeper or not. 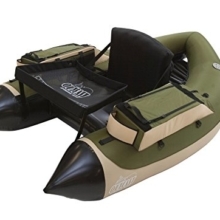 This Teton inflatable fishing float tube is a great way to begin your journey in the fishing world. With the plenty of features that it comes with, it’s pretty affordable and high-end. The Bighorn Inflatable Fishing Float Tube is both quality and quantity. Quality because it’s made of superior materials and synthetic fabric. And quantity because it has an extra-large seat with a very comfortable backrest. Therefore, all of that contributes to the maneuverability on water. And of course, credits go to its hydrodynamic hull shape and unique sculpted design. Both of the armrests consist of vast areas for storing gears. Both of these areas have compartments comprised of over 3 different zipped divisions. There are also back seat storage space and exterior mesh pockets for more room. The D-rings of the Bighorn Inflatable Fishing Float Tube is also included. So, if needed, you can always attach extra gears and creel bags to it. Naturally, the stripping apron along with the fish ruler is a great feature. It makes it easy to pull up your fish, while the horizontal rod holder makes it a convenient fishing setup. And in terms of the tube build, the Bighorn measures about 54 x 50 x 27 inches (LxWxH) and weights no more than 11 pounds. With the measurement and influence that it comes with, the tube is able to carry a load of 350 pounds in total. That includes both the passengers and the equipment. 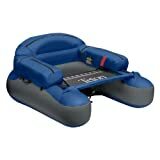 This is mainly a nice fishing float tube because of the ample space that it has in its seat. So, after a long and tiring fishing session, you can quickly chill and float around the lake for a while. The tube runs incredibly fast. Perhaps a 10 out of 10 from us. For those who are looking for something in which they can spend some quality time fishing, this one’s for you. The Outcast Fishcat 4-LCS is a sturdy, high-quality constructed piece for the water with a good time warranty from the manufacturer. Made from durable 500 Denier PVC fabric, this comes with a 5 years manufacturer’s warranty. It is, in fact, a great fishing float tube known for its versatility and durability. The fabric offers incredible abrasion resistance and tear aversion. The armrests come with two saddle bags that are gigantic for storing your accessories. Compared to any other float tubes, this one has the most significant possible storage space for you to store all you want. The Outcast Fishcat 4-LCS weighs only about 15 pounds and can carry about 300 pounds of load. Even after such load, the float tube stays very stable on the water along with excellent and improved traction. Before we forget, let us tell you that the Outcast Fishcat 4-LCS has a high seat. This enables you for an improved vision on targeting your large trout. It has closed-cell foam back and seat that is sewn into the seat cover. If you have owned other fishing float tubes, you could give this a try. We assure you that you will love it! Yellow has always been the go-to color for any water-related accessories, and this float tube wins as for its color already. This sporty fishing float tube called the Caddis Sports Premier Plus Float Tube is the first choice for many. In terms of design and durability, the Caddis Sports Premier Plus Float Tube has upped their game more than any others. Look at the teardrop design. The little gem is going to glow under the sun. And along with being stylish, it is also heavy-duty. Out of all the right things about this float tube, one of them is that it’s very easy to assemble. You don’t need an electric pump or anything else – only a hand pump would suffice. The tube bladders are placed accessed through the substantial storage areas on the armrests. While on the subject of storage space, the two-sided pockets are more than enough to store your fly boxes and other fishing gear. The drink holder in the front mesh steals the show. This is indeed a perfect fishing float tube for ponds or lakes (smaller water bodies). It is beyond comfortable with more than enough storage. You can invest in the carrying straps and attach it to the D-rings for easy transportation. And not to forget that the design is pretty easy to move about, enabling you to cover a fair amount of water. Don’t worry about the pricing, this handsome boat is very much affordable with the quality that it comes with. Under a very reasonable budget, you can float around the luminous river like La-Z-Boy. That’s because the Super Fat Cat is all about comfort and performance. If you compare it to the Outcast Fish Cat, this one is much luxurious than that. The Super Fat Cat has amazing back support and comfortable seat. And it’s substantially higher than most of the other models. Hence, you have better visibility of trout from up above there. The best part about the Super Fat Cat is that it stays scorched inside. No matter how rough the water may get, it won’t come inside the seats. This does have a great impact on your fishing experience because wet seats might become slippery and an issue for many fishers out there. The Super Fat Cat has the advantage of not moving much unnecessarily on water. Even with a load of 300 pounds, you will find that the float tube moves about effortlessly. And also, there’s some significant storage space that the Super Fat Cat comes with. Since the Fat Cat is evidently bigger, the storage space is very roomy. The armrests consist of really big storage space along with a more spacious storage area behind the seat. Additionally, the Fat Cat’s pockets are designed in such a way that there’s a separate rod holder and carefully planned additional external pockets. And you don’t need to worry about the zippers getting damaged. They are of really high-quality, and when it comes in touch with water, it won’t spoil. Overall, the Fat Cat float tube merely is of great value. It has an overwhelming and unanimous review from its owners. You can never go wrong with the Outcast Super Fat Cat. You will never get bored of using the Caddis Sports Pro 2000 Float Tube. This unique fishing float tube makes spin casting very simple and also enhances the stability of the boat. This float tube is more of an economical option for those who are looking for the basics in a boat rather than the qualities of an expensive boat at a much higher price. However, the features of the Caddis Sports Pro 2000 Float Tube are no less. Made from 420 Denier nylon pack cloth, it’s strong, waterproof and protective on water. The tear-resistant strength will take you through any situation and rocks. The tube is doubled stitched for higher durability. It’s quite comfortable, with 2-inches foam seat and backrest that is enough for you to relax after a full fishing period. Of course, it comes with a very spacious two main pockets and two other auxiliary pockets. Besides, it also has the extra cargo space for storage behind the seat. The low-profile pontoon-style unique design enhances stability and control. 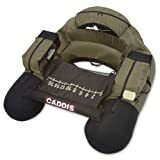 With being only 11 pounds, the Caddis Sports Pro 2000 Float Tube can take a maximum load of 250 pounds. And don’t stress it, the float tube is easy to pump with merely a hand pump or a foot pump. Just like the other fishing tubes, this one is also very sturdy and 100% puncture resistant. You will be delighted with its performance, regardless of the fact that it’s a central float tube. Needless to say, there is a bit flex in the back and seat movement when padding with fins. This budget-friendly model has an excellent value for what it comes with. It’s very lightweight and easy to maneuver around. The Outcast Fish Cat 4 Deluxe is an excellent float tube with tremendously high-quality floatation. In fact, consumers who have bought a float tube for the second or third time in their life, they reportedly prefer the Outcast Fish Cat 4 Deluxe LCS because it is beyond their expectations. This U-shaped boat performs amazingly as an above-the-water seat for fishing. You can stay warm and move faster around the lakes and rivers so cover more of the water body. The seat is fully inflatable, which makes it extra comfortable to sit on it during long hours of fishing. Moreover, the backrest is compact that allows for easy transport. And you can always outfit your float tube with an additional anchor system. So, do you consider yourself to be a recreational angler who’s keen about staying on water for long periods? Well then, this float tube is something for you. It’s affordable and small in size that makes it easier to store when deflated. The float tube is not at all heavy, weighing only just 16 pounds. However, it can take a load of 250 pounds without any trouble. Made from 500 Denier PVC materials, it has a 5-year manufacturer’s warranty, which makes it an ideal choice for anyone who’s keen about fishing. Before we forget, let us tell you that the pockets of this tube are quite large. They are roomy enough to store your fly boxes along with other gears. And the mesh pocket with zippers can hold stuff like that’s needed at hands such as sunscreen lotions, chapsticks, tippet, nippers and hook file. The Outcast Fish Cat 4 Deluxe LCS moves really well with little to no effort. So, with the Outcast Fish Cat 4 Deluxe LCS by your side, all you need to do is blow up the seat and backrest and chill on water. Another one of those masterpieces from Caddis has bought you with an improved version of all the other Caddis models that we’ve listed. It’s not only an improved version in terms of the features, but also look-wise. It’s so stylish! This U-shaped float tube has a unique feature: the stabilizer bar prevents the float tube from collapsing inwards. The padding of this float tube is styled in such a way that no matter how rough the water wave might be you are going to be dry and safe. Also, the seat is higher than it will give you the stadium feel while fishing. You have better visibility under the water, and thus you can catch your favorites in one go. It streamlines your mobility for which boarding this type of fishing float tube is much easier than many others. And did we mention how heavy-duty it is? It’s unbeatably durable and delivers outstanding stability. Although some of you might feel that the seating is quite a bit of oversized, it’s incredibly comfortable for those who have thicker hips. The backrest if unquestionably comfortable, so no complains about that. And the tube being oversized has the advantage of the tube having four side pockets along with a storage compartment. It has everything that you need in a floating tube; padded stabilizer bar, fish ruler, stripping apron, rod holder, D-rings, carrying handles and fly patches. The Caddis sports Nevada Gold Float Tube floats like no other. What you need is a good pair of flippers to move around with the tube on water. Here are some guidelines that we hope you will find useful when selecting your fishing float tube that will best suit your activities. What are some of the most common float tube designs? U-shaped, round tubes, teardrop-shaped and pontoon style fishing float tube. Now it might be a bit confusing to understand which one would suit you better. You need to understand both the tubes and its functionalities. The U-shaped fishing floating tubes are the first ones to come in the industry. They are easier to get in and out of that also happened with ample of storage space. Each side has mesh pockets and compartments for you to store your fishing gear. Comparatively, these tubes are much easier to maneuver than their cousins (round shaped ones) as it has better back support. Bear this in mind that if you’re going fishing for long hours, this might be the one for you. The Round shaped tubes were more commonly seen in the market before the other shapes came in. They are now becoming less popular with more innovations in the fishing industry. Round tubes are difficult to move about and steer across the water because of the lack of keel in them. The good thing about these tubes is that you have excellent seating space. Now coming to the Pontoon style float tubes, these are likely to give you nicer traction and maneuverability while pedaling. In these pontoon style tubes, the seats are higher that’s actually further up for better visibility. And of course, you have a lot more room to yourself, not squishing yourself into the corner. This boat is also more comfortable to get in and out. Last but not least, we have the Teardrop shaped fishing float tubes. They are more like hybrid float tubes that are essentially made for the best traction. They are similar to a dinghy boat. You have more backroom in this type of boat. They make great boats for those who plan on going fishing for long hours and are the latest design that has arrived in the market. Always and always choose a float tube that is able to support you through rough and tough situations. This means that you should go with something, the fabric of which is puncture-resistant, tear-resistant and very strong to take you through rocks and rough waves. From what we have seen, the most robust materials that make the strongest float tube is the ripstop fabric. This is what they used to manufacture parachutes. It is very well known for its ability to prevent tears even if it brushes against abrasive surfaces. Typically, the design of fishing float tubes determines how much of a load it can hold. Don’t just think of your body weight when considering a fishing float tube. Think about the type and number of accessories and gear that you will be taking along. Hence, when you are thinking of the weight capacity, opt for something that’s able to take all the weight combinedly. You might be thinking that this factor is not necessary. Well, if you are new to fishing, you should really know that you will be carrying a lot of gear with you, and you will have to. And if you are an advanced level fisher, you already know what you are supposed to carry and how great pockets and attachments are. Float tubes with fishing rod holders drink holders, and plenty of compartments make it way more comfortable for you to transport your gear. If the tube that you have chosen doesn’t have this feature, trust us, you might have to face a little trouble carrying your accessories. And speaking of attachments, D-rings are your life savior. These come in very handy when you need to attach other features around your tube. The more you go fishing, the more you will understand how many features you need to achieve the ultimate fishing experience. You will need to carry your fishing float tube to your preferred destination. And it is highly essential for you to consider a tube that’s easier to carry. Unless you have a fishing lake next to your house, it would be tough to carry something that’s not transport-friendly. Keeping this in mind, the first thing that you should reflect on is the weight of the float tube, which should be something that you can manage. Next, look for something that has the ‘backpackable’ facility. These tubes usually are lighter and are easy to carry just like a bag. They come with padded straps, which is unquestionably more comfortable to hike around with for hours. Float tubes are usually very comfortable. It’s basically air that you are sitting on. The only comfort that you should look for is the seat and the space associated with the seat. Look for seats that have an ergonomic design or are highly padded. And not to forget about the adjustable backrest. They play a huge role in maintaining comfort, too. The backrest is what allows you to get enough support for your back and provide you with stress-free, comfortable fishing experience. Why Should You Get a Fishing Float Tube? Admit it, kayaks are expensive. Although they last longer, have a hard-shell body and some of them are also able to carry two persons, but have you seen how expensive they are? If you are a solo fisher, who likes to wander around the lake whenever they get a little bit of time out of their busy schedule, get a fishing float tube. A right fishing float tube will never let you down. With much innovation in the fishing industry, the fishing float tubes can be carried like a bag. Since it’s inflatable, you don’t need to worry about taking it via flights either. Put it in your luggage ad you are good to go. But for boats and kayaks, you need to transport it via a vehicle, which is honestly quite a bit of a hassle. Most inflatable tubes just require a hand or a foot pump to puff it up in under minutes. Isn’t that way more convenient? Sure, it is! These floating tubes maneuver effortlessly. They are very stable and move with very less effort from your side. With such stability, you can sit for hours on the tube and relax, even if you don’t plan on fishing. Q1: Can I perform trolling in a fishing float tube? Answer: Yes, sure you can, but know that it’s very tiring and experts always recommend not to. However, fly-fishing is much suitable for tubes because you surely are going to lakes and flat rivers. Q2: Do I need leashes when I’m out with a fishing float tube? Answer: Well, at times you may lose your gear on water for which it’s highly advisable for you to have some leashes to protect your accessories from being lost forever into the depths of the river or lake. Q3: What if my fishing float tube gets punctured? Answer: Don’t worry about it. Most of the float tubes have emergency floatation chambers, which exist in the system. So, there’s less chance of you sinking into the depths of the water. Besides, repair kits do come with the tube in its pockets for emergency cases. You can always make use of them. Q4: Why do I need my personal floatation device (PFD) with my fishing float tube? Answer: Have you ever thought of emergency cases where your fishing float tube might fail? In fact, if you don’t know how to swim, only your life jacket will save you from drowning in the middle of a lake. PFDs are also a requirement for most fishing lakes. Q5: What waders are ideal to use with float tubes? Answer: Neoprene Waders. Undoubtedly, neoprene waders and neoprene socks are good enough if you don’t want to feel uncomfortably cold. It works as an excellent insulator for the cold, and you can stick to fishing rather than just keeping yourself warm. Practice: Before you get into the fishing, you must first practice on floating on it first. Get a pair of flippers and practice. Carry small paddles that comes as a handy tool for paddling. With an array of options available, you need to choose the one that fits your needs. Make sure that the boat is easy to maneuver. If you are a big guy, you need to fit into the tube and to be able to handle it. Rainy weathers are horrendous for float tubing. But wind blowing it can be used as an advantage but not wind blowing out. Do take note of such factors. It’s better to bring extra than to regret later. Make sure that your box and storage compartments have enough supplies to survive you through a successful fishing session. A fishing float tube is undoubtedly the most comfortable, safe yet also the most enjoyable way to relax through a weekend by doing something that you love: fishing. Hence, it’s crucial to choose a fishing float tube that’s going to keep you safe and sound on water. While you might be on a budget, you must still ensure that your fishing float tube is durable and comfortable. And on top of that, if it’s backpackable, that’s the best you could have. We hope that by looking at the facets that we have featured in this buying guide, you will be able to find what you need to fulfill your dreams of outstanding fishing experience. If you’re still unsure, let us know in the comments section, and we can always have a constructive discussion. Happy Fishing!